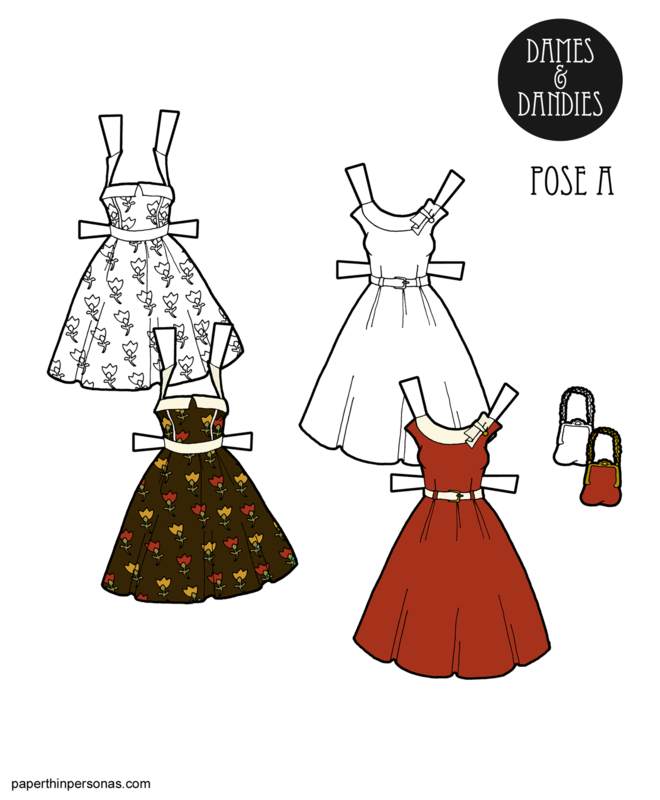 Printable Black & White PDF Printable Color PDF More Paper Dolls & ClothesToday’s paper doll dresses were inspired by retro-rockabilly styles. I’ve been thinking about rockabilly dresses ever since I posted this version of Aisha and Julie, of Paper Doll School, suggested that the pink haired version needed some rockabilly dresses in pastels. Well, I confess that pastels just didn’t seem seasonal, so I went with autumn tones (which perhaps don’t go as well with the pink hair), but if you head over to the Patreon page you can download the spring time pastel version. Meanwhile, there maybe some changes coming to the blog in the new year, so I’ll be putting up some polls looking for thoughts and I hope folks will respond. And, as always, if you like the blog consider donating to the blog, following me on Instagram, or leaving a comment. Printable Black & White PDF Printable Color PDF More Paper Dolls & ClothesOne of the things I love to do is draw paper doll clothing from fashion catalogs and magazines. Clear pictures are useful, but so it seeing clothing I might not have thought up myself. This set of paper doll fashions were based on the latest Autumn trends. Sleeve details and ruffles are not super popular. So are blouses, so here we have some blouses with sleeve details. To go with this pair of blouses, there is a pair of skinny jeans tucked into boots. The paper doll also has a matching purse. I chose a color scheme inspired by Pantone’s Fall 2018 color report. I hope you all enjoy this contemporary fashion addition to the A Pose Ladies fashion wardrobes. Retro Astronaut Paper Doll, Because… Space! I am prepping for some quick travel over the next few days, so this post is going to be short. I still have to figure out how to fit all my liquids in a single baggie. Meanwhile, I had a lot of fun drawing this retro science fiction astronaut. I know I haven’t done a real astronaut yet, but I am having so much fun with these zany retro ones. For those of you who don’t know, I keep Pinterest boards as one of my favorite ways to collect images. My Retro Futuristic Fashion board has all sorts of images that influenced today’s paper doll. Also, if you have a moment and want to do me a favor, there’s a poll about the blog post images over on Patreon. You can vote even if you’re not a Patron and I hope you do! 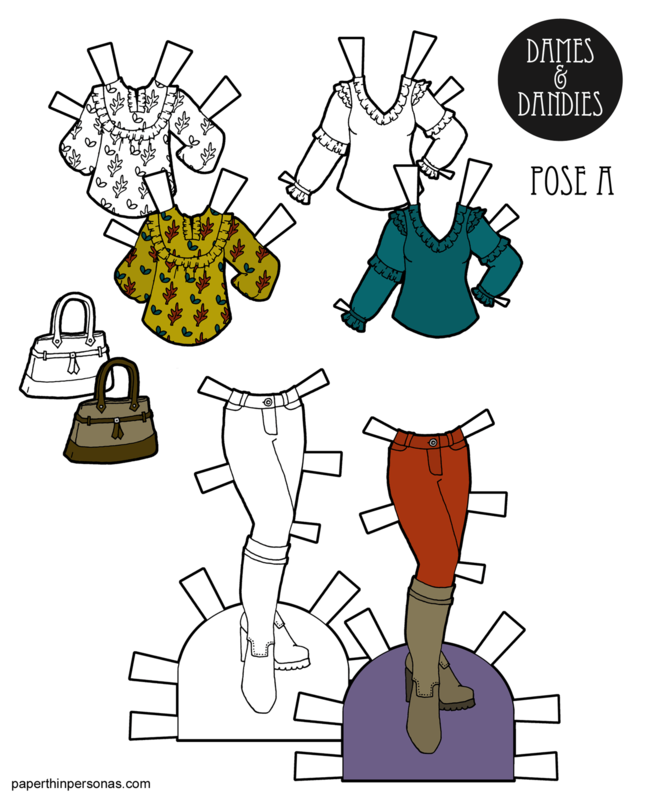 It’s all about how the post images I create of each paper doll set should look. And speaking of voting, if you are in the USA, I hope you will vote on Tuesday (or perhaps have voted already, if you live in a state that allows that). It’s super important to vote, so please go vote! Printable Black & White PDF Printable Color PDF More Paper Dolls & ClothesJust in case last Friday’s sheet ghost wasn’t your idea of a best Halloween paper doll ever. I wanted to create something else. So, here we have a bit more Gothic fashion take on the holiday. The only thing that really makes these “Halloween” is the color scheme, so you could recolor the black and white version if you wanted a more traditional Gothic fashion version. I have been trying to do a paper doll for most holidays with the Dames and Dandies series, because I have such fond memories of my Grandmother sending me paper doll holiday cards when I was a child. So, anyway, the A pose paper dolls here are are getting corsets and long skirts for their Halloween attire. What are people dressing up as? I confess I’ve never been a big Halloween person. I do like handing out candy, but ever since I moved into an apartment I don’t seem to ever get tricker-treaters. It makes me kinda sad. Anyway, it’s probably best I don’t have a big bag of candy in my house anyway. I would end up eating more of it than the kids, I suspect. If you need a way to pass the time waiting for young ghouls or goblins, why not color or cut out Halloween paper dolls? It keeps up manual dexterity and is a lot of fun. 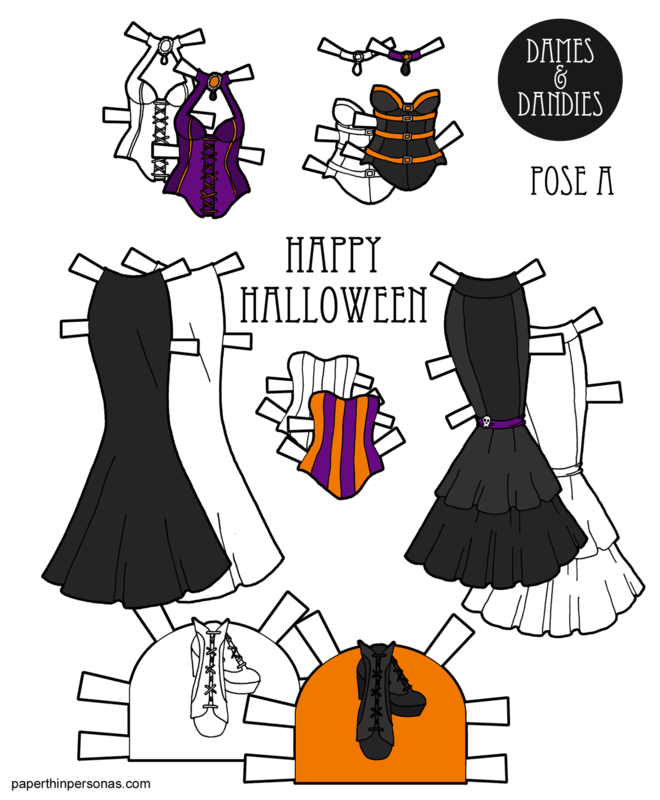 You can see all the blog’s Halloween paper dolls in that tag. So, I was going to do a normal week of paper doll content and then I realized this was going to the 100th Dames and Dandies paper doll post and I wanted to do something different to celebrate. This week is going to be a week of round-ups. So, here’s every A Pose Dame for the Dames & Dandies from January until today. Tomorrow, there will be very B Pose paper doll and then all the C Pose paper dolls. I organized them by theme, rather than by date. And that’s them all! Woot! And if you’d like to help support the blog consider becoming a Patron, there’s a bunch of extra color schemes there for A Pose posts. 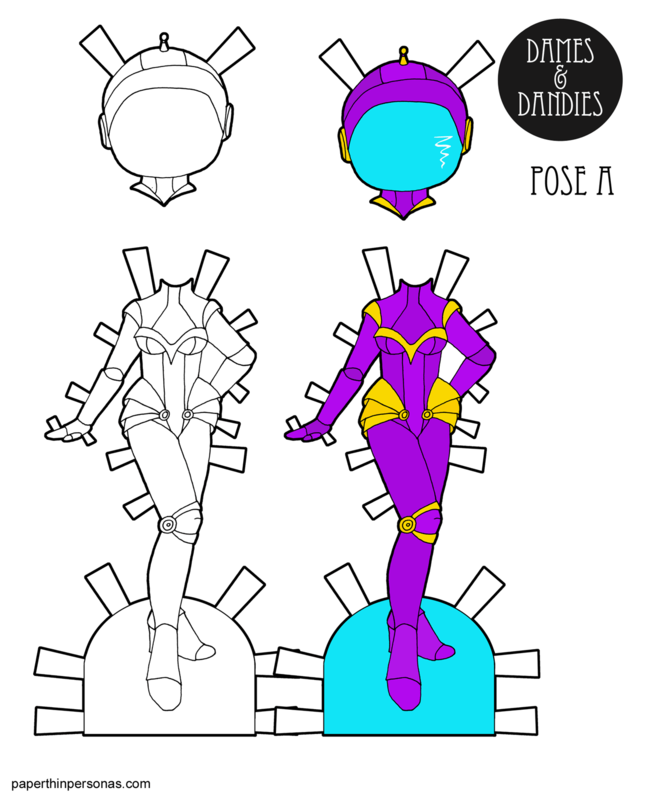 Is there a theme you’d love to see for the A Pose Dame paper dolls? A fairy? A mermaid? More science fiction? A specific time period? Let me know in a comment! And once more into the 1920s my friends. Once more. Today’s dress, hat and purse are both based on a design from B. Altman and Company. B. Altman and Company was a luxury department store, so the clothing tends to be very fashionable and on the more expensive side. 1920s Fashions from B. Altman & Company is a collection of reprints from their catalogs from Dover Publishers that I used. The other hat was adapted from a design from Sears, another major department store of the era. Also from a Dover book, but that time I used Everyday Fashions of the Twenties: As Pictured in Sears and Other Catalogs also from Dover. Both of these books are pretty easy to find on the secondary market for reasonable prices. 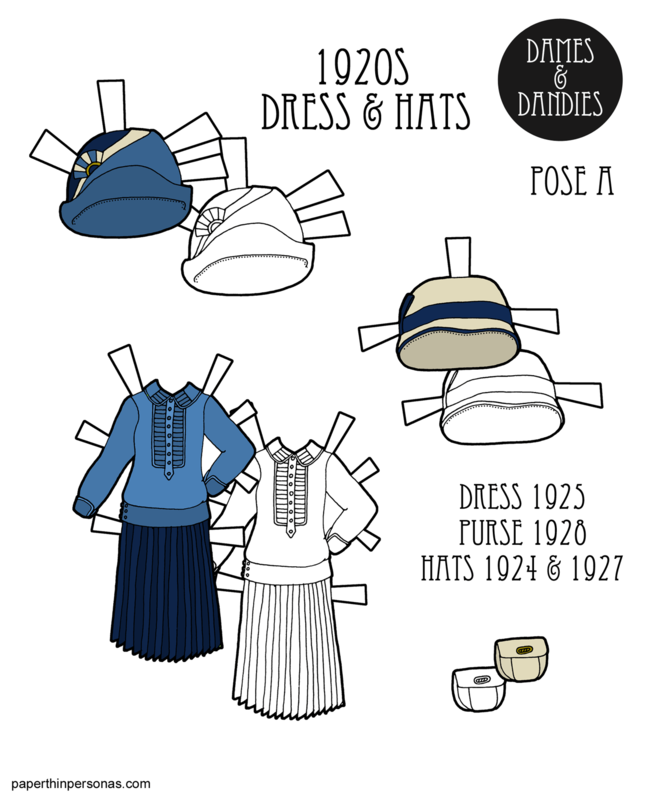 In case you’ve missed any of my 1920s paper doll series, here’s what I’ve created so far. In the works is some 1960s clothing for the paper dolls (as voted on by my Patrons), but I have no idea when those dolls will be done. I also really want to do some more older historical styles like the 13th century, but I haven’t really tried to tackle that yet. Soon, I hope. Meanwhile, enjoy my foray into the 1920s. And if you’d like to help support the blog (I very much run PTP through the NPR model- no ads and maybe people will be nice enough to help me offset costs) consider becoming a Patron. 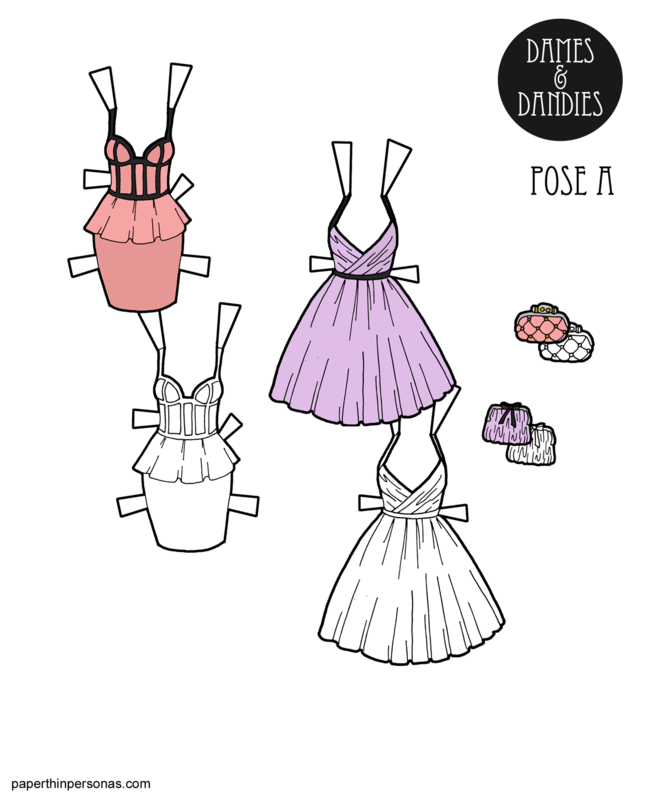 Printable Black & White PDF Printable Color PDF More Paper Dolls & ClothesLast year, there was a real influx of pastel colors into fall and winter looks. It’s been going on for a while. I’m not sure this is still on trend (my September fashion magazines were pretty slim this year, sadly), but I drew these paper doll cocktail dresses a while ago. I wanted to contrast the black with the pale colors. I also wanted to play around with shape. Plus the A Pose Dames don’t have any cocktail dresses and that seemed just criminal. Poor paper dolls. They need something to wear to evening parties, after all. There’s a second color scheme for these over on my Patreon page, but it’s Patron only- so you’ll need to join if you want to see it. Meanwhile, follow the blog on Instagram for more pictures of my sketchbook and bread-making adventures. And, of course, I’d like to wish anyone fasting today for Yom Kippur an easy fast.